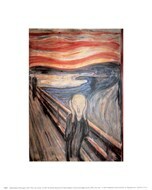 The Scream art pieces display expressionist artist Edvard Munch’s most popular painting. This talented work displays a tasteful combination of bold, earthy hues, making it a suitable addition to a variety of color schemes. The dark browns and oranges in The Scream prints mix well with other dark, warm colors, and will make a strong statement when placed against colder blues and greens. “The Scream” was created by Edvard Munch in 1893, and is considered one of the finest masterpieces of the modern art period. 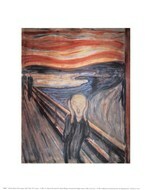 The Scream paintings are very popular with fine art enthusiasts, and are also a large part of today’s pop culture. They match up wonderfully with more traditional decorative schemes, but The Scream artwork can also stand out as a tasteful accent against a sharp, modern environment. These works of art can be a part of several different themes. Fans of Munch’s work can use this masterpiece along with his other works as a tribute to the artist himself, and The Scream wall art can also be a part of a decorative approach that showcases the Expressionist movement. 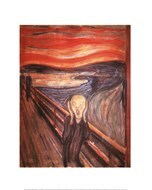 The distinct mood of The Scream art pieces are a perfect example of Expressionism. The obvious distortion of reality for dramatic effect helps to convey the anxiety and tumult felt by the creator, and projects those feelings more effectively than an accurate portrayal of the scene. As a result, these pieces match well with a thoughtful and pensive environment.